Daniel had a great idea for a program based on his sport and he has shown remarkable resilience in developing different versions of it. 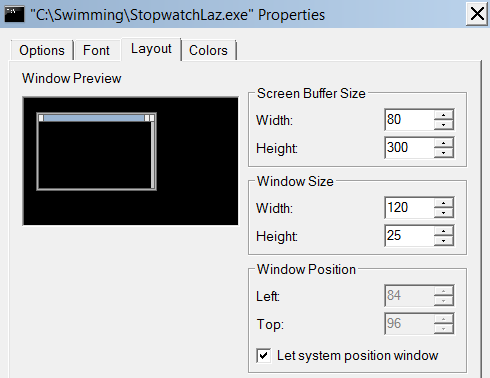 Using StopwatchLaz you can time up to eight swimmers completing up to four lengths with one of four different strokes. You just press the key of the appropriate lane number each time a length is completed. In addition to displaying the times for each length, the program determines any standard (e.g. Gold, Silver or Bronze) achieved by each swimmer for each length. The first screenshot shows the offer of a choice of seeing the instructions or using the stopwatch. The following screenshot shows the instructions in a window with the width already set to 120. We tested the program for a butterfly race with six swimmers and obtained the following screenshot. Download here a zip file containing the code (StopwatchLaz.txt). The program uses the crt unit, so compile it using Lazarus. Daniel has copied and edited code very many times and has used procedures with a parameter to make the code neater. As his confidence grows he will be able to introduce more parameters into his procedures to make them more versatile and thereby tighten his code further. Click on the link below to see all the code in one large html file. Be prepared for a significant delay if you have a slow system. Student programs to inspire you!